Honestly this theory is kind of disproved because of Chapter 57. The only reason some people get slammed and such is because the Titan is reckless and tries too hard to grab them so they end up killing them before they get to eat them. (And when did a Titan headbutt someone?!) Regular Titans do not discriminate as to who they eat or who they don't eat. Besides, if your theory was true, then what about the the wad of people that were spit out when Trost was being cleaned up? Wouldn't they have transformed? My theory is that titans don't need to eat titan shifters, they need to eat someone with the regenerating power. I believe that the ability to regenerate their own human body is different then the one that heals the titan. 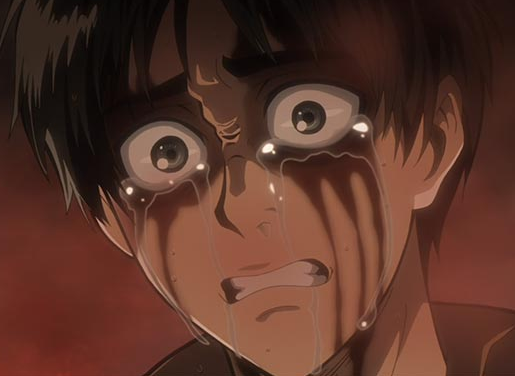 When Reiner told Eren not to transform because his body was still healing he meant, don't transform or you will become a stupid heat stroked titan. When eat someone with the ability they gain it through some means and their body regenerates allowing them to be cut out safely. Last edited by TehTitanKilla on Thu Jul 10, 2014 5:32 pm, edited 2 times in total. And Annie healed when she was fighting Levi Squad. No offense but the theories don't make any sense. Also you showed a video saying that Thomas doesn't have a death scene but in said video it is there. I don't get what you mean by no death scene when he is in a Titans mouth and gets swallowed. And Annie does have a reason. We just don't know it, yet. liala wrote: I agree with A7X. No problem we all make mistakes after all. You can still come up with theories but you have to think about it a little more.